On Tuesday my friend Jane Fitch, also an interior designer, and I made our annual pilgrimage to Decorex at Syon Park. Decorex is internationally renowned for being THE event to discover the very best and most coveted products from 400 exhibitors. Decorex has been running for 39 years and this is the third year that I have been. We were not blown away by much this year as it was very much the same exhibitors as last year. However some new blood gave a much needed injection of interest. I've included below a few newcomers as well as some highlights. Naomi Paul beautiful crocheted lampshades were a feature in the VIP lounge as well as on their stand. Their ethos is to create beautiful functional textile objects by highly skilled craftsmanship and they certainly have achieve this. The lampshades are simple, stylish and elegant. Bert and May are another newcomer to Decorex. They are committed to raw materials, natural pigments and fine craftsmanship which they certainly have achieved in their products. They launched a fabric range at Decorex which were beautiful subtle colours and bold geometric designs. Santorus is another exciting newcomer. Brother and sister, Fabian and Tara have a rich cultural heritage of Indian and Italian parents and their products certainly reflect this. I adore the patterns and colours of their fabrics and wallpapers. 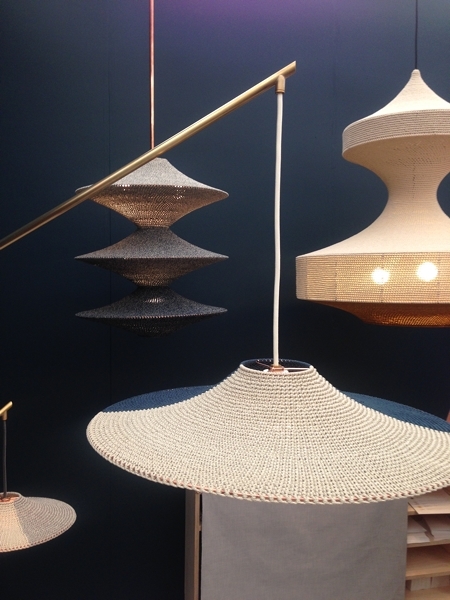 Tom Raffield is a relative newcomer to Decorex. Their beautiful wooden lighting and furniture are made in a woodland workshop in Cornwall where the company is based. Tom Faulkner is not a newcomer to Decorex but I am always interested in visiting their stand and seeing their exquisite handmade furniture. No visit to Decorex would be complete without a vist to the Ochre stand. I am always in awe of their celestial pebble light! There is always the obligatory over-the-top glitz and these Murano chandeliers by iDogi were no exception! This chandelier was the princely sum of 130,000 Euros!! I always look forward to the floral displays on the exhibition stands but they were few and far between this year and very disappointing. The one that stood out for me was on the Sir John Soane Museum stand which was designed by Ben Pentreath and the magnificent display of dahlias was grown and designed by Ben's partner Charlie McCormick. This stand stood out from all the others for its design and colour. To finish this whistlestop tour, here are a few more shots that I took. I hope you enjoyed seeing a few of the highlights of Decorex. It was a long day as there were over 400 stands to see. A few glasses of bubbly in the VIP lounge with canapes helped to keep up our energy levels! Did you go to Decorex this year? What did you think of it and what were your favourites? I would love to hear so do drop me a note. Design Week 2015 at Chelsea Harbour is the perfect environment for meeting and greeting the great and good of the interior design world. Find out all the juicy design details of my first day at the Design Centre.